OS X Yosemite lets you specify the application in which you want to open a document in the future when you double-click it. More than that, you can specify that you want all documents of that type to open with the specified application. “Where is this magic bullet hidden?” you ask. Right there in the file’s Info window. Click one of the files in the Finder. In the Info window, click the gray triangle to disclose the Open With pane. From the pop-up menu, choose an application that OS X believes will open this document type. Now Acorn opens when you open this file (instead of the default application, Preview). 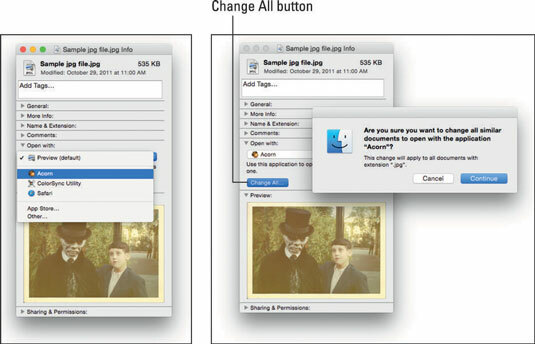 (Optional) If you click the Change All button at the bottom of the Open With pane, as shown on the right side of the following figure, you make Acorn the new default application for all .jpg files that would otherwise be opened in Preview. Notice the handy alert that appears when you click the Change All button and how nicely it explains what will happen if you click Continue. Here’s one more technique that works great when you want to open a document with a program other than its default. 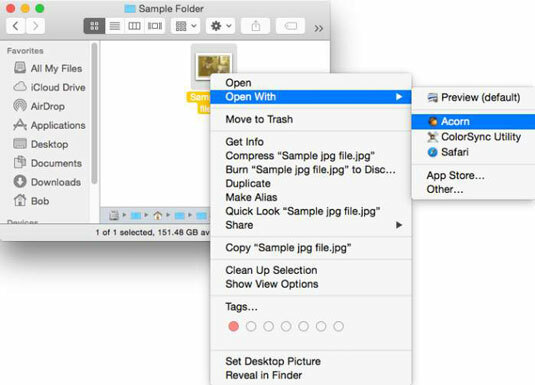 Just drag the file onto the application’s icon or alias icon or Dock icon, and presto — the file opens in the application. If you were to double-click an MP3 file, for example, the file usually would open in iTunes (and, by default, would be copied into your iTunes Library). But if you frequently want to audition (listen to) MP3 files with QuickTime Player, dragging the MP3 file onto QuickTime Player’s icon in the Applications folder or its Dock icon (if it’s on the Dock) solves this conundrum quickly and easily. If the icon doesn’t highlight and you release the mouse button anyway, the file ends up in the same folder as the application with the icon that didn’t highlight. If that happens, just choose Edit→Undo (or press Command+Z), and the mislaid file magically returns to where it was before you dropped it. Just remember — don’t do anything else after you drop the file, or Undo might not work. If Undo doesn’t work, you must move the file back to its original location manually. Only applications that might be able to open the file should highlight when you drag the file on them. That doesn’t mean the document will be usable — just that the application can open it. Suffice it to say that OS X is usually smart enough to figure out which applications on your hard drive can open what documents — and to offer you a choice. One last thing: If all you want to do is open a file with an application other than its default (and not change anything for the future), the techniques just described work fine, but an even easier way is to right-click the file and choose another app from the contextual menu. You can also change the default application to open this file by pressing Option after you right-click the file, and the Open With command will magically transform into Always Open With. Alas, you can’t change the default application for all files of this type; for that, you’ll have to visit the Info window.